To learn more about these progenitor cells and identify any vulnerabilities that could potentially be exploited to prevent the development of breast cancer, Khokha and colleagues isolated cells from the mammary glands of mice and examined how they changed in response to progesterone. The researchers had previously measured all of the RNA molecules produced by mammary gland cells. Now they quantified all of the cells' proteins and assessed the cells' epigenomes—the various chemical modifications to a cell's chromosomes that help determine which genes are turned on and off. 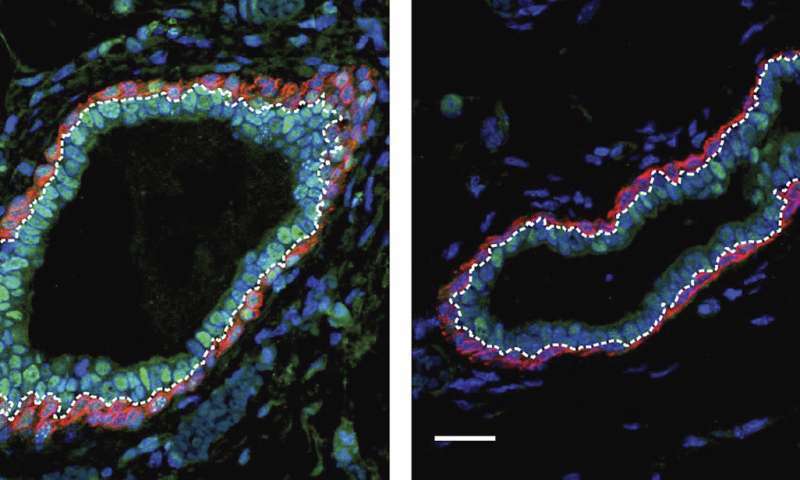 This global overview of mammary gland cells revealed that in response to progesterone, progenitor cells—particularly luminal progenitor cells—up-regulate many of the epigenetic regulatory proteins responsible for modifying the cells' chromosomes.